Further to yesterday's post about textile art at The Brindley, Runcorn, I sat for a while in the cafe journalling, in part about looking for inspiration in places I assumed to be uninspiring. It didn't take long to find potential sources. These two photos were taken in the carpark of the centre. and a window in a remaining wall of an otherwise derelict building. Feel free to beat me to making something based on these photos if they tickle your fancy. Today I set off for Durham for a distance learner day at Stitchbusiness, hopefully via the Quilt Museum in York. No doubt there will be more inspiration in store. Yesterday I went to Runcorn County Court. Runcorn is a dump. It is a town centre in decay surrounded by a ring road and dominated by the Bridge over the river Mersey. The court is in a dismal shopping centre on the outskirts. But it turns out Runcorn has a theatre and arts centre which I did not know about until last week, The Brindley. It was recommended to me for the cafe ( which in fact is pleasant but unremarkable), but when I went to the website for directions I discovered it had not one, not two, but three textile art displays on. Who knew. There was a cabinet of work by Val Jackson who makes flat, miniaturized versions of clothes. And a cabinet of artists books by Sarah Morpeth inspired by a film I had never heard of; 'I know where she is going', with the she admitted being obsessed for years. Each book investigates a theme or charcater from the film. The light on the glass made it hard to phtograph her stuff - better pictures are here in her gallery. Then, upstairs this room of work by four artists. .
Debbie Smyth builds thread pictures by wrapping around pins to make lines. This representation of the bridge and the small terraced houses under it is about seven feet tall. She also had smaller pieces. I liked that there was a display board downstairs where children from local schools had made their own versions using this method. See more of her work here and read her blog. Clare Lane manipulates photos of the local area and prints onto canvas then partially stitches over them. Carolyn Kirton draws stitch pictures of her teenagers and captures their attitudes and body language. I liked her titles which included one entitled 'She well proper had a go at me and stuff'.' and 'Its not my job'. and this one of the lady who died and her photographs. I had the whole room to myself and was able to just reflect in the quiet surrounded by the art. I was really struck by the fact that that in such a superficially uninspiring place they had found inspiration not just for one piece but a series. I was also struck by the way that each artist had focused right down to one technique and one theme. I would love to know if artists who produce such cohesive bodies of work find it naturally to choose only one method and to produce piece after piece different to but closely similar to the others. Or is it something they have had to work hard to focus down onto? If the latter, how did they do it? How did they choose what not to do? Have they other series that I have not seen or are they content to keep doing the same kind of work? I may have to contact them and other artists who appear to me to be very focused to see if they can shed light on this as it is fascinating me. Do any of you have views on how you do or do not limit the techniques and themes you use? Finally, I was struck by the way in which each artist made a large sample of their work which was hung on the walls specifically for viewers to touch. I have not actually got much quilting done recently as I have been concentrating on City and Guilds samples. Often, to get time to do that I have to pack stuff and do it on the trot, travelling for work. Which is fine - it removes the tedium of bad TV in hotels. But, eventually I get heartily sick of packing and unpacking items. Consequently I just leave them packed and add more. This then is the sorry state of my little 'train embroidery box' as it was left on my sofa last night. As it is going to Leeds tonight I think it needs a sort don't you? These blocks are ones I got in a swap which I never showed you all yet. They are a bit crumpled as they have been folded away in another box. I specified African applique and left people to it. I now have to try and work out how to put them all together - I think a huge jumble of African prints with some black strips to connect and separate everything is probably the way to go. Now, all I need to be is in one place for long enough... but,as tonight I go to Leeds then tomorrow night, on my way home I collect Dennis from Manchester Airport (he's been in Ireland) so that we can sleep at home then go to Durham for a City and Guilds learner day on Saturday....so that's another two sets of stuff to pack then. Sigh. I didn't mean to take a blog break but as I was working in London last week, despite in theory having access to the Net in the hotel lobby, a post never happened. 'Twas not all work though. First stop off the train was the Byzantium exhibition at the Royal Academy. No photos allowed and not much sketching done as it was heaving and the items on the whole small so it was hard to linger close for too long. There are key images here though. One day I only had a half day lecture to give so we went bookshop browsing down Charing Cross Road and to buy a mass on good maps for our trip from Stanfords ( the same place Michael Palin buys his maps for his explorations!) In Borders I discovered this launch issue magazine - more like a paperback book really. 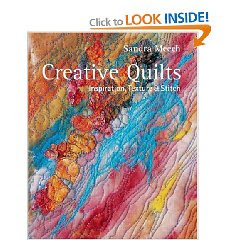 Lots of quilty inspiration in there. Then, I discovered a bookshop on Euston Road which opened just after I was last there and specialises in remaindered coffee table books, many by Thames and Hudson. I snatched up this rather scary looking one , also on Aboriginal Art (for £10) and this one on Pacific patterns for just £5. Now, I must go and eat cake. Dennis is at his parents in Ireland and last night a friend who cane for tea arrived with 4 iced ginger squares, a whole cream strawberry sandwich cake and a box of chocolates. That on top of the treacle tart I made for desert. Then, mid evening , my sister arrived with the gift of a half chocolate sandwich cake and a half coffee cake from my Mum. Oink. This has to be a quick clandestine post because any minute now Dennis is going to come and confiscate my lap top. I have until my bath runs because the water is masking the clicking of the keyboard keys. He is coming to get it 'for the good of my health' becuase I sat on our sofa for twelve hours yesterday and - bar a couple of loo breaks and a lunch- I did not move. I was busy booking all kinds of hotels and car hire all around the world and it got kind of addictive! But speaking of baths, I did get kind of bath obsessed. First, I fell in love with this one which is a overflowing bath by Kohler. Dennis doesn't get it. In fact we have one of these at home only there is no cool drip tray - the water just spills all over the carpet when I forget my hips are more than they were and underestimate the Archimedes effect. 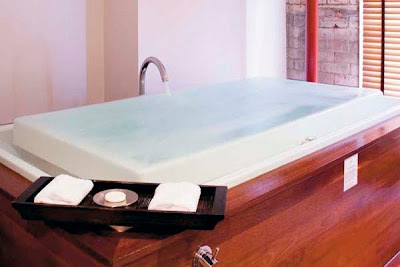 In fact I could not have this bath becuase, apart from the price of the suite it was in, we wanted to stay at New Years Eve and the hotel (the Henry Jones Art hotel in Hobart) books out three years ahead. Then I wanted this bath, in a Japanese hotel room in Tokyo. This one I was allowed to have. Except that the permission was phrased, "Well, if you really want it book it but it costs £175 more than the room with the normal bath and you are staying very near the shops in the textile district. Oh and the bath it outside and its winter when we go to Japan." Spoilsport. Instead I went to the Hilton where for a less money I get a normal bath but in a suite with a whole swimming pool downstairs. Ok, not very culturally Japanese but the pay off is that we are going to go on a trip from Kyoto to bath Japanese style with the locals in these public baths. Beatutiful! 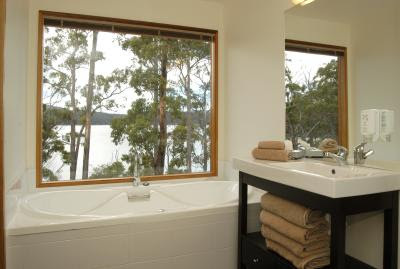 And, despite it being New Years Day when we arrive I was able to score this spa bath at Stewart Bay Lodge in Port Arthur, Tasmania for a snippet. And before anyone tuts and tells me I could do equally as well with a youth hostel shower, you are right. Save that the shower would last five minutes if that and the idea of lying in this bath with a nice drink and looking at the view is going to last me through all the boring work days until we go in January. That's the point! In a recent post I thought I was being funny about my crankiness about everything that came across my path that day. However, as with most of my posts it was written, sent and not maybe really thought enough about. "I think they are just missing the point and they are humourless, selfish, uptight people. ( I accept that when I have had chocolate and water and sleep I may think that they are lovely people who are just missing the point.)" I had meant this to be a crack against my own unreasonable attitude on that day and to say that when I was in a better mood I would not think ill of the people themselves but would see that they had a perfectly reasonable point on which I disagreed. It was meant to be a joke against myself and my bad temper But, in hindsight it was an extremely crass thing to write. I have had a personal email from a quilter I know and respect who does dislike bad photos of her work being on someone else's site and who was extremely distressed to be described as humourless, selfish and uptight. This person is far from that. They work hard on their web site to share information and resources and they were one of my first influences in quilting. I am mortified that (a) I upset them so much (b) that I may have upset other readers who have not contacted me a (c) that anyone might think that I was calling Brenda herself humourless etc. 1. Copyright law is copyright law. Brenda and other quilters who want to protect their copyright in all ways are absolutely 100% entitled to do so. On my post I did say that Brenda was right. 2. It may make me cranky on a bad day. Lots of perfectly legitimate things do. The fact I am cranky does not alter the law or excuse me writing something capable of being interpreted as a personal attack on someone who is not cranky about the law as it stands. 3. People who want to protect their copyright in a way which they are entitled to do so are not humourless, selfish or uptight. I however, on a bad day react to perfectly lovely and right people in an unfair way which may be funny to many readers but patently not to those who feel themselves to be under attack from me. 4. I am really truly sorry for any offence caused to anyone. 5. The person who emailed me thought that I was calling Brenda herself names. I wasn't but on re-reading the blog I can see easily how that conclusion was reached. For anyone else who also thought that but didn't comment either on the blog or privately let me say that Brenda is another quilter who is more than generous with her time and expertise. She has spent hours and hours assisting our Twelve by Twelve group with her computer and quilting expertise and her blog is chocka full with tips and free tutorials. I can testify - having been with her on a day when she suffered the problems of trying to navigate around Somerset on small, very badly signed roads - that she is not humourless. I on the other hand am clearly an idiot and I apologise. I like fancy restaurants just fine but some nights, no Michelin starred plate can beat a 'crisp butty' for supper. Cheese 'n'onion in case you were wondering. Edit: Please note that this post was meant to be funny but actually it really upset at least one person. I am leaving it up becuase general comments show that most readers got the joke, but do please read it now in comjunction with this post where I correct any unintended offence in full. In short here, this post is a crack against my own bad temper and is not a criticism of any other quilter. I am feeling cranky today. This is probably due to lack of sleep,water and chocolate and would be more productively solved by obtaining all of the three items above ( but not in that order). But, the alternative of sharing my crankiness seemed more fun. So what made me cranky? 1. Over breakfast I read Brenda's post on copyright. She has a thing about copyright. The lack of observance of it seems to make her cranky. (She admits to indignation but frankly there is not a lot of difference.) Everything she said is right and correct in law. I agree that it is bad, bad, bad to steal designs, pass them off as your own and make money off other people's work. But when people get upset because they showed a quilt in a public show at which photography is allowed and then someone showed the photo to someone else on a blog.... well, I am sorry but I think they are just missing the point and they are humourless, selfish, uptight people. ( I accept that when I have had chocolate and water and sleep I may think that they are lovely people who are just missing the point.) The point of course being that if you want your art to be seen why would you complain about people telling other people that they liked your art and showing them what they meant? You learned how to quilt by observing other people's art. Heck, Great artists joined guilds to learn to paint by copying other artists work and we don't complain about that. Just take the compliment and stop fretting. 2. I went for a shower. My new Radox shower gel says on the bottle that it is 'Proven to care'. About what? The state of inmate conditions at Guantanamo? The potential extinction of the lesser spotted meercat? The parlous state of copyright laws? I mean it would be irrelevant but a portion of the price of that gel (even if it is a tiny, tiny portion) went to pay for the ink to write on the bottle Proven to care. And it makes no sense at all. And how do you prove it? Did the gel have to answer a questionnaire about its social responsibility? Or was it secretly observed via nanny cam consoling the sponge when it got treated roughly by the loofah? 3. Yorkshire Bank's ATM informed me today, with a little picture on the screen, that it was voted best for overdraft rates in 2005. All that tells me is that it was not the best in 2006 and having failed to live up to its reputation failed to do anything about it in 2007,2008 or indeed 2009. Why would anyone advertise that they were less than spectacular and too lazy to do anything about it even though they clearly had the capacity to achieve greatness. And besides. I don't need to know. All I want is £50 of my own money. 4. My town has an unusual population cluster in that we seem to have an concentration of stunt people. Or very stupid people. Let me explain. Unless you have the skills to deputise for Bruce Willis in Die Hard ( Ok, its a while since I saw an action movie, I can't think of a better example), then, when you wander aimlessly off the kerb in front of my car without looking it is likely that I will hurt you when I ram your waddling backside with my bumper. It is a certainty that if I have to brake on an open road one more time to avoid having to scrape your waddling backside off my bumper I shall get cranky. I think there might be some cooking chocolate at the back of the fridge. What I am thinking is that when we travel later this year it would be nice to have a book which records not only design ideas I will come across ( nay,go searching for) but also little drawn recordings of, say, the cafe I had lunch, or the colours in the sea and some collage maybe of tickets and brochure pictures, combined with the writing I like to do. I will not be able to carry too many art products and, whilst I may improve with work this year, I anticipate that I shall still be at the standard of simplistic representation rather than Art, ( Unless you interpret that word in the kindergarten sense). So, I was going to practice. Only there were so many other things I needed to do and finish it seemed a bad idea to start yet another project right now. Except I wanted to. Even though I really had to organise the tasks already at hand And so, knowing I had time yesterday hanging around airports ( where they have, thank God, not yet developed a theory that I could kill someone with a Caran D'Ache wax pastel and a watercolour brush, although I did have to smuggle the water in a very small container in with my makeup) I decided to start a visual To Do list. It is simplistic. It was fun. It started me off. Now I have to go and do some of the things on the list, all of which look much more inviting to do simply because they are so colourful! But why is it that once posted the work looks soooo much more childish than in real life?!! So why the panic? Because the workshops sell pretty quickly. Which is where having a retired husband is handy. (I just asked him if he preferred to be called retired or stay at home. He requests 'Major Domo'). I left him a detailed list of requests from me and Best Quilting Buddy Lesley and strict instructions to go online at midday prompt. "All systems go,go,go. I hope.Love you." I ring. He is smug. Since he sent the text not only has the confirmation come through that in fact he did not foul up but also he has been back on the booking system and the three workshops we booked are already sold out. Crazy! And people think quilters are sweet old ladies who make patchwork tea cosies for their great nieces. Imagine the cyber-fighting-at-the door-of-the -January-sales that must have been going on! Anyway this is how come a show that costs £10 to get into is going to cost me more than a family holiday in Europe. 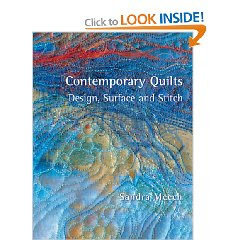 I shall - as you might have guessed from the illustrations - be going down to Birmingham early to do a two day workshop with Sandra Meech pre-show called Connecting Art to Stitch. So that's six nights hotel then. During the show we both get to do a three hour workshop Create and Colour with Clare Martin where we play with different product and an hours slot with Laura Kemshall. Plenty of the four days left for shopping and shopping, ahem, I mean looking at quilts and - um, shopping ( make that a family holiday in the Maldives) together with a lecture on design from Magie Grey, a lecture on Egyptian Quiltmakers by Jenny Bowker and a session on embroidering on water soluble film. With dancing one evening and the company of a wonderful and entertaining friend... I can't wait. PS. Does anyone need a lecture on Forced Marriage any time this year? I have bills to pay! You may notice the new banner. Thanks go to Brenda who rang me all the way from Australia to teach me how to do it. She has a tutorial on her blog sidelines as well. Also to my Dad who took the photo - my original intention was to use a piece of my own patchwork but this photo suits the template colours so much better. I have also discovered Picassa today and spent hours trying to organise my pictures, Digital cameras are great in letting you snap away to get the best shot but I have learned today that it is a good idea to weed out the duds fairly frequently! I have learned how to make a Picassa album which will come in handy when we start to travel later this year and I want to share my photos with you all. Until then, because the Twelve by Twelve challenge this time around is Windows, I have made a test album of all the photos I held of windows in case any one needs inspiration. Yesterday I got an anonymous comment on an old post about the Museum of Asian Art in Bath. Not a nasty one, a nice polite one asking about my old post where I said I had found it 'disappointing'. Not even truly anonymous in fact because Mrs MA Dixon sighed her name. But, because she had used the anonymous option to leave the comment ( presumably not being a blogger - she said she had 'stumbled on my post whilst googling') I cannot now reply to her. (Save as below). But the experience lead me off on one of those random linking in the brain sessions to inspire this post. I am busy booking accommodation for our round the world trip. This takes hours and hours and hours. I love it. I really do. However, Dennis says I am odd in this regard. 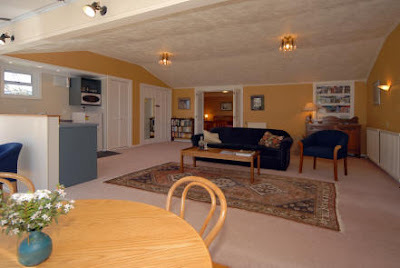 So I am curious as to where I fit in the general range of habits when it comes to booking holiday accommodation and ask for your comments by way of research. His way is simple - get your wife to narrow it down to three options then pick ( I suspect guessing which one he thinks is the 'right' answer i.e the one I like best!). He firmly believes that most people don't care where they stay. They book the first place thy see in the right city within their price range on the basis that ' its only a place to sleep'. 1. 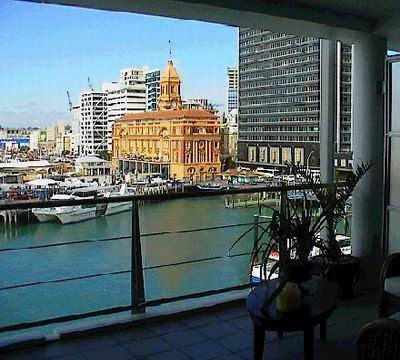 I google as many phrases and I know will bring up accommodation lists in say Auckland. 2. I trawl through each and every item on each and every list, keeping open an Internet Explorer for each possibilty. 6. I then take my shortlist to review sites such as 'tripadvisor' - which is where the connection with Bath museum comes in. Reviews also have to be filtered. What if the person who loves the place is the designer of those hideous bedspreads? How can they be trusted? What if they say a place was a 'luxurious treat' when they usually go camping? Specific comments are of use or comparisons with other places I already know. Otherwise I trust my own view more. 6. 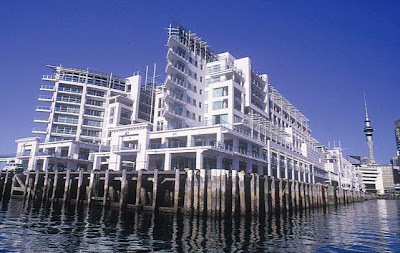 This process usually results in one place which stands out as being 'us' - hence the photos which are from http://www.aucklandwaterfont.co.uk/ where I reserved an apartment. However, some times it is difficult to find something just right and the search has to be repeated with more inventive words or links from tourism places found. 7. I can compromise. 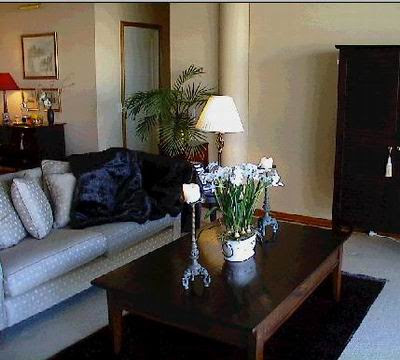 For example, in Rotorua I sacrificed my reaction to the curtains table skirts in this suite ( what were they thinking?!) to the fact that you can get a float plane to pick you up from the bottom of the garden to take you flying over volcanoes. So, anyway - I don't mind being obsessively freaky because I know I will have the best place to stay anywhere I go. But I'd be interested in what your accommodation choosing methods are. Closer to mine or closer to Dennis? And as for that museum. Mrs Dixon, if you are reading, given that you said you liked ceramics, I think you will love it. The reason I was disappointed was because there was little 'art' as in paintings or textiles - mostly ceramics! See how careful you have to be with reviews? Last week I went to Borough Market in London. I wanted to buy stuff but as I was already carting around a pile of heavy magazines which Julie kindly toted over from the US for me I resisted. But as I am about to redo my design modules for City and Guilds I found myself noticing texture and form and line... if any of these photos inspire you to design please take them. Unfortunately, Helen is the last of her kind.